This is my first tutorial, so, if i'm doing anything wrong tell me. Turn on fl and this can begin. You see these boxes with the names Kick hat snare clap ? Right click them and delete them. you will notice a box with the letters "sampler" on it, dont worry about that, it appears if nothing else is there. If you want to use the asio drivers, go to the menu at the top of the program, click options - audio settings, and change the primary soundcard to the Asio4All driver. (Asio is fast and good, doesnt work for me but it probably does for you, so if you hear the program is lagging, and the song getting slow and stuff, try the asio drivers." Now that you've got your playlist open (i'll get back to it later) we can start this. song mode is used when we use the playlist (i'll get to that again later) but just have pat mode on now, i'll explain more later. 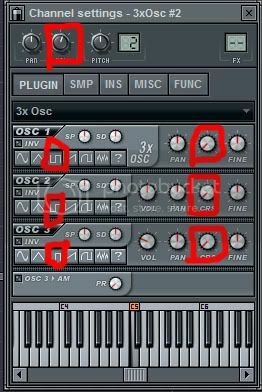 i'll explain the 3xOsc synth, the 3xOsc synth is a 3 oscillator synth, each oscillator has the ability to make a sound based on what waveform is chosen for it, you'll notice i've selected a for each oscillator, this is a saw waveform/shape. 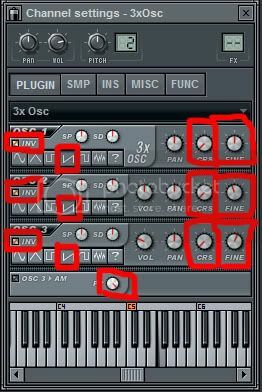 Using multiple 3xOsc synths for one lead or melody is often handy and makes the sound better, but it has to be tuned properly to sound well"
The piano roll is used to make the leads/melodys, bass or whatever you need to make with it, it's very easy and good. you write notes on it by left clicking on it, this will make a green line, wich you can resize at will, and right click deletes this line. 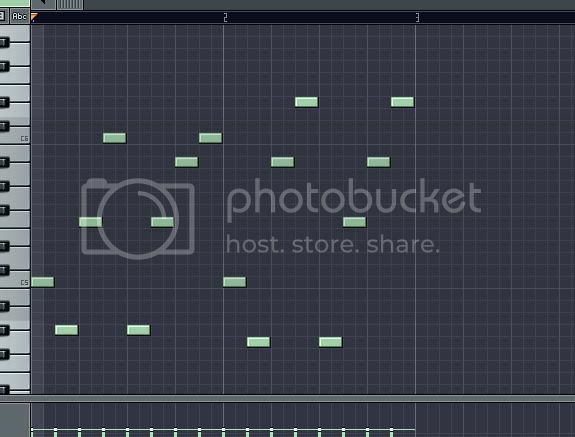 now, draw this into the piano roll, try as best as you can to do it like i did. it might not sound good else..
now i'll discuss the playlist you opened earlier, like the piano roll, left click to create, right click to remove. you use the playlist to set up your songs, the song is broken up into paterns wich you can then add together to fit your liking. 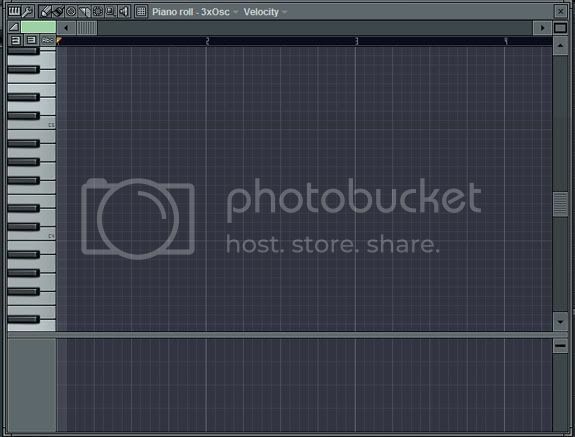 this will resize the annoying huge boxes of the playlist to a usable size, you're going to have to do this every time when you turn on fl. i dont know why it keeps reseting. Do you see the white box on the playlist? the one after the word, Main automation, try deleting it by right clicking on it. After you've removed it, use the middle mouse button or right click on the Main automation letters (pattern) and select rename, press backspace and rename it to nothing, this will leave you with a clean playlist. 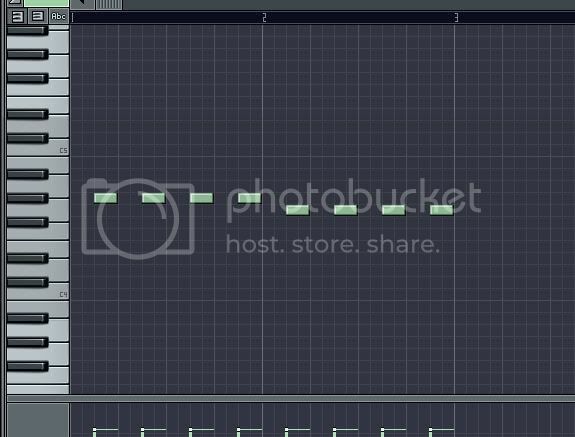 you might have noticed that your melody has disappeared, that is because when you rename a pattern you automaticly go to it, so press pattern 1 to go to your melody again. But we're not going to do that now, press pattern 2, we're going to add a Bass sound here, so that our melody is on pattern 1, and bass is on pattern 2. This is just basic bass, i wont go deeper into it make sure you set the notes at the exactly right place or else nothing will sound right later. Remember when i told you to be in pat mode in the beginning of this tutorial? change it to song mode now, you should be able to figure out how to do that. click the song button below the pat button. now go to the playlist once again. Make sure you draw the correct patters onto the playlist. on the browser on the left of the program, select packs - vintage. press play... sorry.. i know.. baaaaddd, in the next tutorials (if there will be) i'll show you new techniques on how to make good beats with effects and all that stuff.. but for now... this.. Awesome! Thanks! Just today I was thinking it would be nice to find a good tutorial on this. 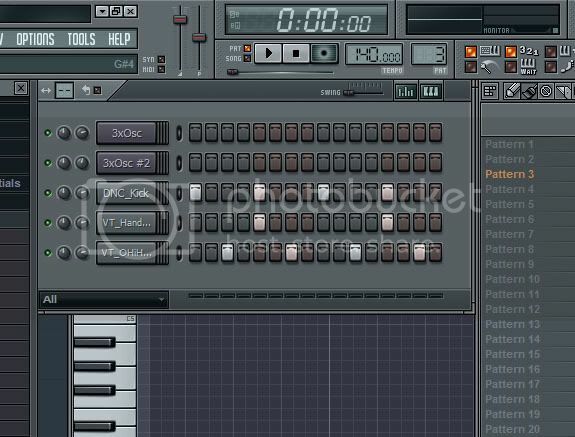 I have the FL Studio Bible but haven't dug into it that deep. Thanks for commenting the next tutorial i'll make will be about the 3xOsc and Effects, and i'm going to show how mixing those two together can make very very good sounds..
and if anyone's in need of help with fl, just ask me, i'll help..
Nice tutorial. 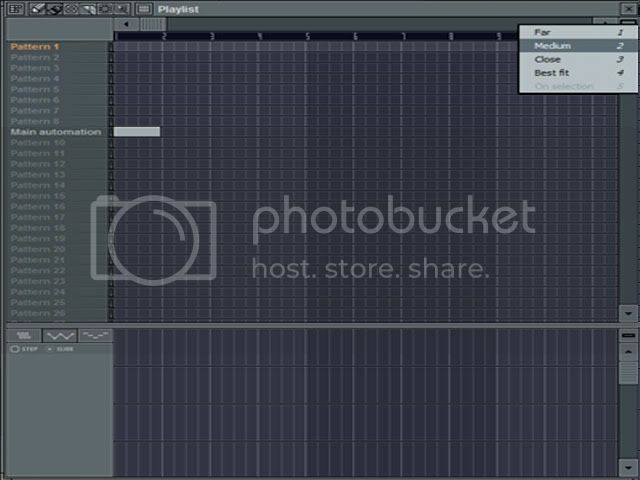 Is your all of your music done on the demo of Flstudio? Because your music is really good. I didn't think you could produce anything that good without paying a couple hundred for the full program. 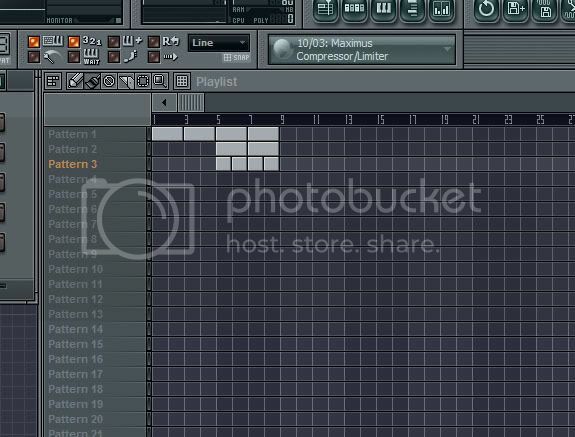 Quote: "Is your all of your music done on the demo of Flstudio?" 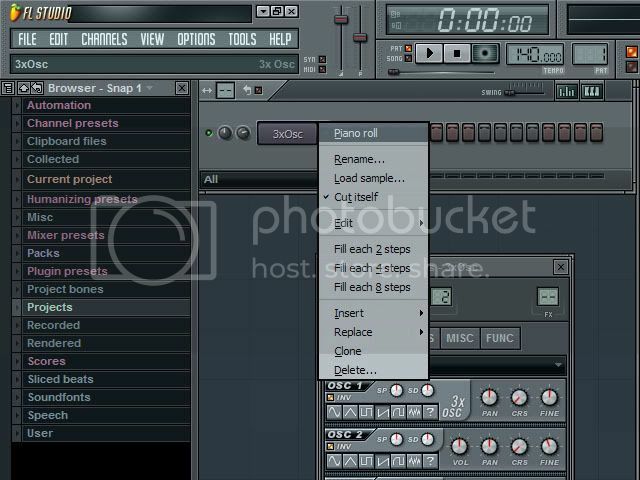 nope, i have the FlStudio Producer edition. Cool, but can you still produce good results with the demo or should I just bite the bullet and buy the full program. Quote: "Cool, but can you still produce good results with the demo or should I just bite the bullet and buy the full program." you can do litterally everything in the demo that you can with the full edition, just not save, you should play around with the demo for a few months, and when you have used it for a while, buy the fruity edition (99$) or the Producer edition (149%) .. Cool, Thanks. And again great tutorial. Great tutorial, I should write some as well. 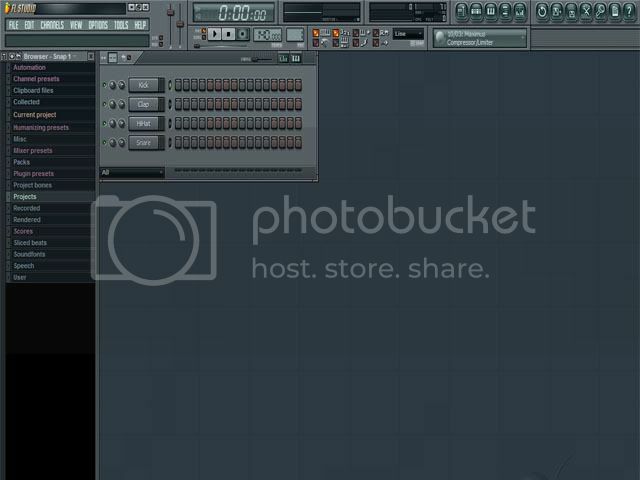 Well done Lucifer, I'd like to use FLStudio until I get myself some proper recording equipment. Wow, thanks Lucifer, this tutorial really helped. 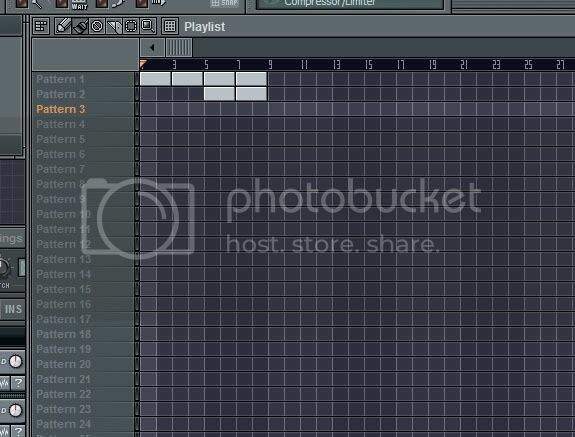 Now FL Studio isnt just sitting around on my hard drive anymore, it's actually got a use - thanks! LOVE this... it is very helpful. Thanks for the tut! 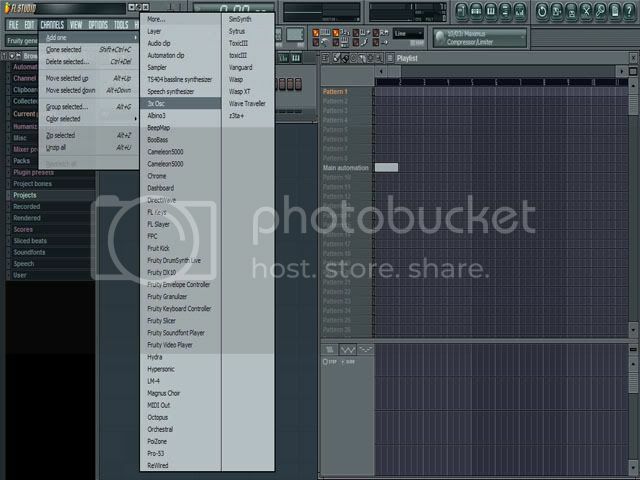 I already made my first song! Check out the attachment. Click the pic to get to my latest project! I listened to your song JohannesM, it's much better than my first song good job, keep it up!